Geez, how did it take me so long to start writing about Trespasser? I finished it less than a week after it came out, but Life interrupted and I never got around to writing it up. Until now! I’ll open with the lede: This is the one truly essential DLC for Dragon Age: Inquisition. I’ve played and enjoyed all three story-based expansions, and each has something to offer, but Trespasser is the best of the lot. 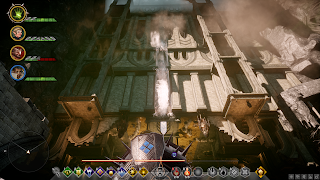 It tells a compelling story that directly ties in with the main plot of Inquisition, and, more importantly, provides a deeply satisfying conclusion to the Inquisitor’s personal story. 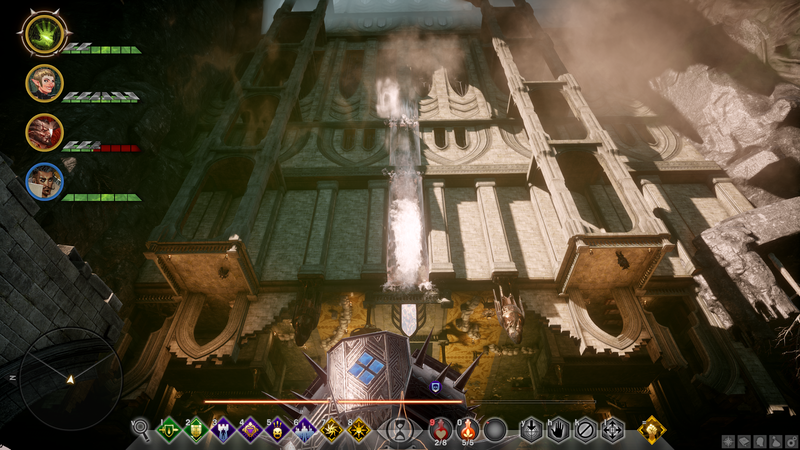 BioWare has clearly learned from their success with Mass Effect: Citadel. Trespasser isn’t exactly a Dragon Age Citadel, but it captures the main beats that fans responded to so strongly in that exceptional DLC: spending time and having fun with the characters who you’ve grown to know and love over the dozens of hours you’ve spent playing the game. There’s a lot of humor, a lot of pathos, and, if you play your cards right, more than a little romance along the way. The overarching plot is dramatic, but the actual gameplay feels a little tedious at first. Go into the eluvian, fight some enemies, come back out, advance the story, go back into the eluvian, fight some more enemies, rinse and repeat. It helps a lot that the Crossroads is such a beautiful and fascinating place. I’ve never understood people who complain about the Fade; those bizarre and dreamlike environments have always been my favorites, and it was great to see more non-Euclidean geometry and symbol-laden tableaus on display. One thing I had to keep reminding myself was that I, the player, had different knowledge than Aztar, the character, did. From seeing the cut-scene at the end of Inquisition and the trailer for Trespasser, I knew that Solas was Fen’Harel and would come back. However, Aztar did not know this. I’ll admit to occasionally muttering, “When are we getting to the fireworks factory? !” while mucking around with Qunari agents, wondering when Solas would finally show up. And I’d think that Aztar was acting pretty dense in not recognizing that Solas was behind stuff, before reminding myself that I personally had had no clue until seeing that post-credits teaser. Speaking of which: I hadn’t thought about it before, but that’s actually a pretty significant difference in the narrative structure between Origins and Inquisition. Origins is set up a bit more like a movie or something, with periodic cut-aways and cut-scenes. In order to advance the story, you’ll sometimes see Loghain and Anora or someone discussing strategy or plotting their next move. There’s no in-game explanation for why your character would know any of this stuff; it’s just that you, the player, presumably need to know it in order to be able to follow the story. In contrast, Inquisition (and I think DA2 as well) are much more disciplined. You only have access to the knowledge that your character has. You directly witness most events in the game; when you learn other things, it’s usually because someone else is relaying information to you. In the rare event that you see a cut-scene, it’s because your character is watching that cut-scene (as in Calpernia’s crystal; you’re actually watching your character watching the scene), or it’s something your character is remembering (as in regaining your memories of the Divine’s assassination). All that to say, the Solas/Flemeth cut-scene is unique and surprising formally as well as lore-wise. After having experienced it, it’s hard to wind back down to the more conventional storytelling of the rest of the game. 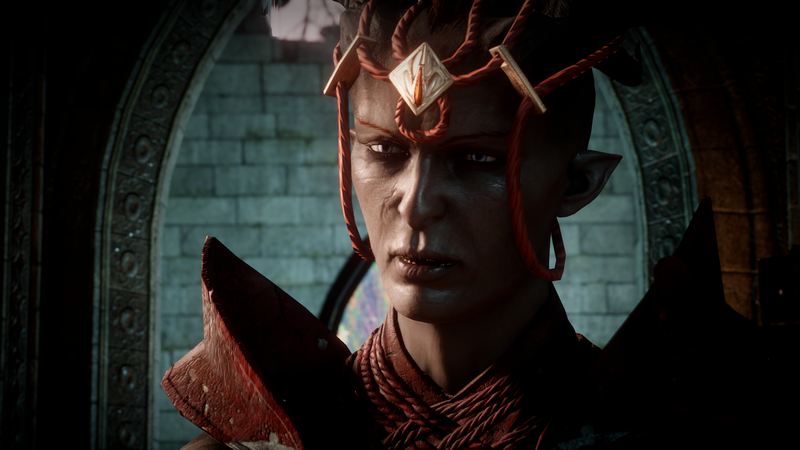 Anyhoo… the Qunari stuff felt like it went on for too long, but ultimately ended up being really interesting. The series has been foreshadowing an upcoming with with the Qunari since early in Origins, and Trespasser pushes that conflict to the brink. 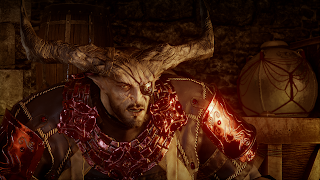 For me, one of the most shocking moments was when Iron Bull betrayed me and attacked. It was both totally unexpected and made total sense, which is the best kind of twist. And I can’t say I didn’t “deserve” it: after all, I was the one who had pushed Bull to renew his devotion to the Qun. The way it went down was fantastic, though. When he raises arms against you, he says something like “Nothing personal… bas”. It’s a one-syllable line reading that totally blew my mind. All this time, when Bull was saying “boss”, I took it as a mixture of affection and loyalty. But he was hiding in plain sight all along, secretly sneering at me while professing his allegiance. It got even better in the post-game, at least with my particular world state configuration. The Qunari leadership denied any involvement with the Viddasala’s actions. They got bogged down in an escalating war against Tevinter and, amazingly, reached out to the Divine to help negotiate a truce. All along, I’d viewed the Qunari as a dangerous but powerful ally, and it was really cool to see that continuing past the end of the game: they had tested me, but I had proven my strength, and so they continued to be a valuable asset for a slightly diminished Inquisition. 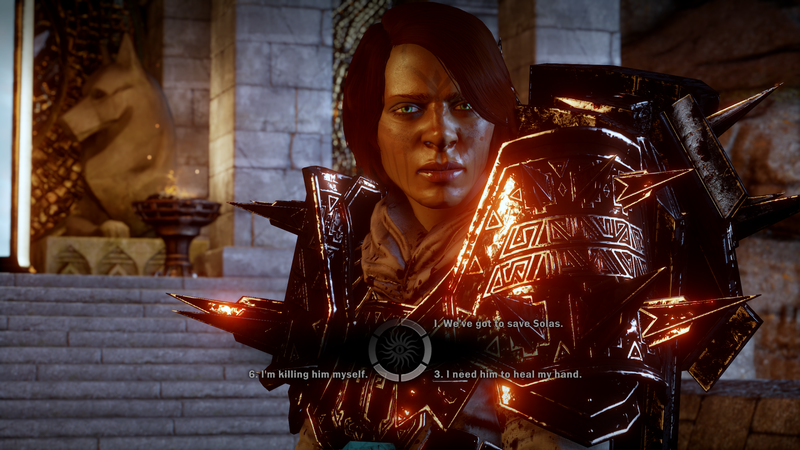 Speaking of which, I was pretty happy with how the Inquisition proper wound down. 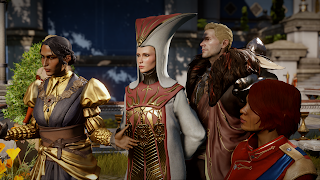 All along, Aztar has been 100% focused on building and leading a powerful organization that would reshape Thedas in accordance with her values. I had imagined it being an extra-national entity that would continue to operate under its own banner and was initially peeved that this was not an option. As I thought about it more, though, being nominally under the control of the Divine was actually a pretty great outcome. Aztar has never been in this for fame or personal fortune: she craves the actual power, not being perceived as powerful. Being formally tied to the Chantry actually HELPS her goal, not limits it: back when it was a rogue group, it could be dismissed as illegitimate, but if the Murderpope officially gives you her blessing to operate, then, wow, you shove pretty much all of your enemies into the shadow. I would be less stoked if it was another Divine, but Leliana and I are simpatico on basically all issues. I’m perfectly happy to have her be the public face of the Chantry while I make things happen. And, while I’m thinking of Leliana, I was also pleased with seeing what seems like the end of the story of the Hero of Ferelden. I had kind of expected that to be something which would be resolved in Dragon Age 4: Kiriyon was last seen searching for a cure to the Calling, and that, combined with Hawke’s journey to Weisshaupt, seemed to be setting up a Gray Warden plotline for the next game. But, given the dizzyingly wide range of possible outcomes for the Hero and the Champion, BioWare wouldn’t be able to design whole games around their statuses. It makes me really happy to think of Kiriyon and Leliana living and loving together in the Grand Cathedral: reunited after so many games apart, they can finally find happiness together, and set an active example for the rest of Thedas to follow as it ponders Leliana’s doctrinal reforms. Plus, it gives me an opening to head-canon Kiriyon undoing the damage caused by Aztar and un-hardening Leliana. Eventually. After all of her enemies are brutally destroyed. I skipped over a bunch of stuff, but fear not! As usual, I have taken a staggering quantity of screenshots, added overly verbose captions, and assembled them into an album for your viewing pleasure. Trespasser ends Inquisition on a great note. 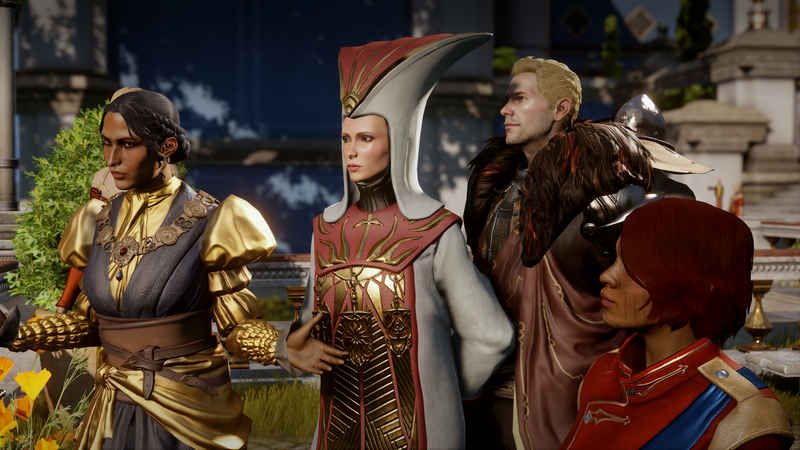 So far, there hasn’t been any confirmation on whether Electronic Arts will approve a fourth Dragon Age game. I have to imagine that it will happen; from what I can tell, Inquisition sold very well, and the investment they put into the new engine work should make sequels a much more palatable financial option. 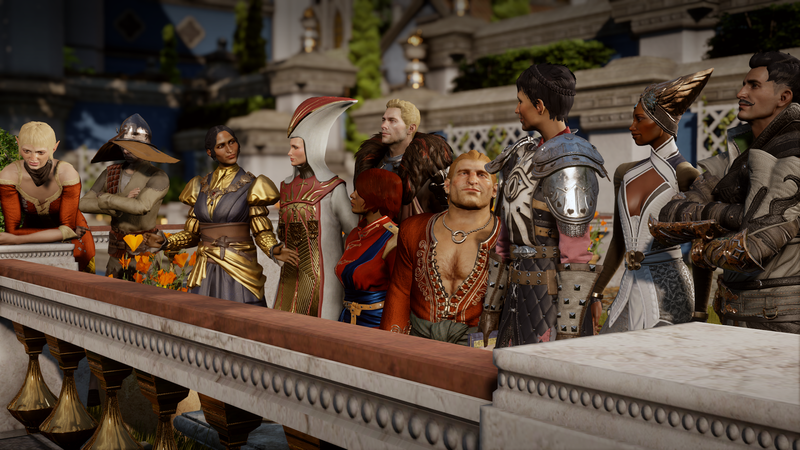 There’s obviously lots of groundwork laid for the next game and it would be disappointing to see if end; but if this is somehow the last Dragon Age game we get, it will be nice to have at least experienced satisfying ends for the characters we’ve played as and with.